As expected, the New Zealand government’s response to the IPCC’s Working Group 3 report on mitigating climate change pays lip service to the science, while maintaining that NZ is doing all that can be expected. Climate change minister Tim Groser’s press release said that the IPCC report’s call for intentional cooperation meant that NZ is “on the right track in pressing for a binding international agreement on emissions beyond 2020” but failed to note the urgency explicit in the report. I’ve been trying impartially to deal with National. 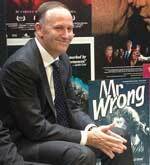 I’ve met with John Key around this a number of times … and really I held the hope that I and groups that I’ve been involved with would be able to get National to see sense. Gerry Brownlee, formerly a minister of energy and fossil fuel, and currently the Minister for Transport and for bulldozing democracy, heritage and social order in Christchurch, today announced that petrol duty will be increasing by 3 cents a litre annually for the next 3 years to fund new roads. Specifically mentioned are the Rangiriri and Tamahere-Cambridge sections of the Waikato Expressway, the Mackays to Peka Peka section of the Wellington Northern Corridor and the four-laning of the Groynes to Sawyers Arms (Johns Road) section of the Western Corridor in Christchurch. The reason given for this policy is that the funding is needed for the Roads of National Significance programme and some upper North Island transport projects. I guess that means more spaghetti motorway in Auckland. The first level of craziness of the petrol duty hike is that it will affect the benefit-cost analysis (BCA) of each Roads of National Significance (RONS) project. Projects like Transmission Gully Expressway, have already been justified to hearings before the Environment Protection Authority on very marginal benefit/cost ratios. Julie-Anne Genter of the Greens said the benefit/cost ratio of Transmission Gully was 0.6. The RONS don’t even break even in BCA terms. Now with the added petrol duty, the marginal benefit/cost ratio would be even worse. However, I bet that won’t make Gerry Brownlee or Steven Joyce any less obsessed with them. The second level of craziness with the petrol duty increase is the Government’s complete failure to understand carbon pricing (which is what a petrol duty is) and to anchor their transport, energy and infrastructure policy with effective carbon pricing. I have no problem with the price of petrol or diesel increasing. Road transport has many externalities that are not priced. It is “elephant in the room” obvious that the most important unpriced externality of liquid fossil fuels is global warming. And not a lack of four-lane expressways. Yes we sort of have an emissions trading scheme which includes liquid fossil fuels which sort of prices carbon. But NZ carbon prices have crashed 72% in 2012. According to estimates by the Energy and Data part of Steven Joyce’s mega-ministry MoBIE, in the three months ended on 30 September 2012, the NZ emissions trading scheme probably accounted for 0.93 cents out of the regular petrol price of $2.09 per litre. So we may describe New Zealand’s petrol pricing policy as having two mutually conflicting parts. The price includes a component for revenue gathering for unneeded four-lane RONS expressways (3 cents/litre). The price also includes a component for the NZETS carbon price (0.93 cents/litre). And the four-lane expressways part exceeds the carbon-pricing ETS part by a factor of 3. This is the complete opposite of effective carbon pricing. Brownlees’s petrol duty, to coin an expression, is an anti-carbon tax. What a shambles! The Minister for Economic Development Steven Joyce had a curious op-ed in the Herald earlier this week. It was aimed at those pesky people who obstruct progress when government tries to remove roadblocks in the way of business development. And very quickly we start limiting our options. It’s difficult not to become repetitive when blogging about climate change. The basic science is well-established. The dangers global warming poses to human society are clear and in some places present. The solutions lie with drastically cutting the level of greenhouse gas emissions and adapting to changes already unavoidable. The mitigation solution in particular continues to be resisted by vested interests and their political allies. I’m conscious of having expressed each of these facts many times over in a variety of forms over the past three years. And now I’m about to repeat myself within a month of last writing about the contradiction in New Zealand government thinking. Bad Behavior has blocked 3205 access attempts in the last 7 days.